Named after the Vale of Tempe in Greece, Tempe, Arizona earned its name in 1879 when a pioneer, Darrell Duppa compared the Salt River to a 300-foot butte near Mount Olympus. Today Tempe is best known as the home to the Arizona Sun Devils. Arizona State University dates back to 1885 when the thirteenth Arizona Territorial Legislature chose Tempe as the site for the college. Located just east of downtown Phoenix, Tempe has over 161,000 residents according to the 2010 census. Arizona State University (ASU) was ranked the top university in Arizona for affordability, innovation, and quality of student. The main campus is located in downtown Tempe and is the hub for urban fun and nightlife. ASU offers online programs as well as college branch locations in downtown Phoenix, Glendale and Mesa. Downtown Tempe or otherwise known as “Mill Avenue” is has a unique college-urban vibe and visitors can enjoy popular establishments like the Mellow Mushroom or Postino Wine Café. Also in downtown Tempe is a variety of arts and culture, from the ASU Art Museum to the Stray Cat Theatre. ASU Gammage is proud to host dozens of live performances every year and has a complete gallery of paintings and photographer from local artists. When the sun goes down, Tempe’s Mill Avenue turns into a mecca for fun-filled nightlife. Whether you like to dance to the hottest tunes on the radio at Fat Tuesday or kick back and savor the taste of micro-beers at the Blasted Barley Beer Company, downtown Tempe has something for you. Shopping, shopping and more shopping! Arizona Mills is home to some of the best retail outlets such as Hurley, Eddie Bauer and GAP to name a few. After you have found all the good deals on new digs, you will want to stop by the Rainforest Café for a bite to eat and enjoy the realistic rainforest experience, including trumpeting elephants and chirping birds. Or perhaps you’d rather take in a show at the Harkins IMAX Theater. Recently renovated this theater has state-of-the-art technology plus comfortable rocking loveseats. Tempe Marketplace is conveniently located off the Loop 101 & the 202 with 1.3 million square feet of vibrant outdoor shopping and live entertainment. There are unique water features, laser elements and outdoor fireplaces plus a ton of options for dining and shopping. Tempe Diablo Stadium is the spring training home for the Los Angeles Angels of Anaheim, California. The stadium was built in 1968 and provides a scenic view of Gene Autry Field and the Marriott Buttes Resort. Another great recreation hot spot is Tempe Town Lake, an engineering masterpiece that protects the area from flooding, creates jobs and hosts dozens of special events throughout the year. Here you can take a leisurely stroll around the lake or rent a boat and take your chances with fishing. Tempe Beach Park is a great place to picnic or cool off in the Splash Pad. Every year this area hosts a variety of musical festivals, holiday celebrations and other family-friendly activities. Of course there is always the excitement of college football and the ASU Sun Devils Stadium is conveniently located in Tempe. For ticket price and game schedule, click here. 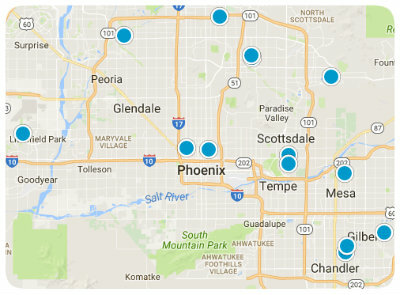 Tempe Elementary School District has twenty-one schools servicing the students of Tempe, and Tempe Union High School District has six high schools that service Tempe and parts of Phoenix, Arizona.